I’ve been on on a bit of a graphic novel binge lately. 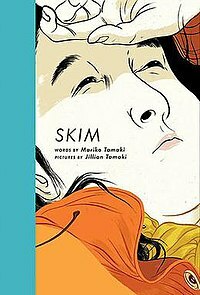 Just finished Skim by Mariko Tamaki and Jillian Tamaki. I thought it was brilliantly written and drawn…not a huge surprise considering that it was chosen as a New York Times Book Review Best Illustrated Children’s Book, that it won the Ignatz Award for Outstanding Graphic Novel, that it was an ALA Notables Top Ten Best Books for Young Adults, and that it was short-listed for the Governor General’s Literary Award here in Canada. I found the relationship between Skim, the main character and her peers disturbing, yet realistic. It was particularly difficult to read some sections, like the one where Skim and another outcast are locked out of the house at a sleepover birthday party. Both kids and adults reading this may find themselves in painfully familiar territory. It’s hard to read about how otherwise nice, average kids can hone in on their marginalized or vulnerable peers for malicious acts typically described as “all in good fun”. The novel raises many questions, especially in light of several high-profile teen suicides that resulted from bullying. Writer Mariko Tamaki doesn’t shy away from tough topics like depression, bullying, and suicide though. She does manage to moderate some of these tough issues with humor. Along the way she also raises questions about teachers with unacceptable ethical standards; sometimes with regard to sexual exploitation, but also around issues of personal privacy. While I’d have loved to have seen some consequences, especially for those teachers, I understand why Ms. Tamaki chose to keep her focus on her main character. Still, I’d highly recommend this exquisitely executed graphic novel to all teens, parents and educators. I’d especially recommend it for those for whom high school is a mine field as it offers some measure of comfort in knowing that they are not alone.